My name is Bianca Jagoe. I am in my mid twenties and live in a sweet old Federation cottage in Launceston, Tasmania, Australia with my husband, 4 cats and our son Theodore. I am a freelance illustrator with a BA in Contemporary Art. 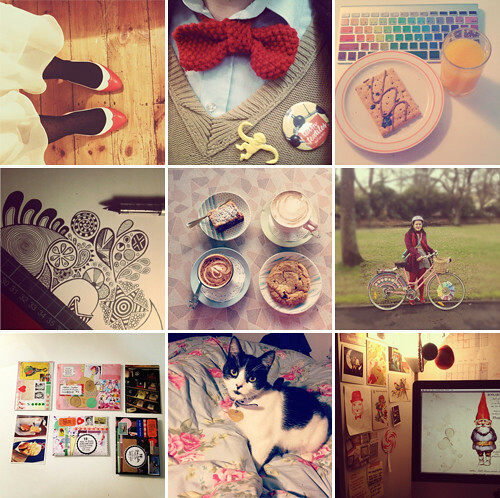 My blog is a scrapbook of sorts for daily creative endeavours and found inspirations. Thanks for reading it! Some of the things I like most: red lipstick, bike riding, markets, zines, spoonerisms, dimples, good black pens, harmonies, Morrissey, Scrabble, mix cds, back rubs, art supplies, Stephen Fry, contagious laughter, collage, old photos of strangers, illustration, pushing buttons, filling in forms, typography, stretching, even numbers, hot cross buns, 50% off, realistic dreams, Tim Minchin, naming strangers, cinnamon, semi colons, curls, Vegemite scrolls & perpetually surfing the internet. Tunez: Why?, Morrissey, Feist, Ben Folds, Big Scary, Miike Snow, The Smiths, Beirut, The Avett Brothers, Sophie Hunger, Josh Pyke, Gotye, Fionn Regan, The Magnetic Fields, Clare Bowditch, Glen Hansard, Kimbra, The National, Jeff Buckley, The Beach Boys, Peter, Bjorn & John, The Head and the Heart. Filmz: Amelie, Ghost World, Silver Linings Playbook, Midnight In Paris, District 9, Perfume, Catfish, The Dangerous Lives of Altar Boys, But I'm A Cheerleader, Pan's Labyrinth, The Virgin Suicides, The Orphanage, Religulous, Stranger Than Fiction, The Hunger Games, The Perks of Being a Wallflower, To Kill A Mockingbird, Office Space, The Breakfast Club, Once, The Big Lebowski, Jane Eyre. Teeveez: Six Feet Under, Girls, Orphan Black, Breaking Bad, True Blood, Daria, Firefly, Peepshow, Game of Thrones, Misfits, Spaced, Downton Abbey, The Mindy Project, New Girl, Fresh Meat, The L Word, Scrubs, Arrested Development, The Mighty Boosh, Wonderfalls, The Young Ones, Mad Men, Pan Am, Our Hero, Pushing Daisies, Gilmore Girls, Miranda, An Idiot Abroad, Dexter, Call The Midwife, Janet King. Readz: Ready Player One - Ernest Cline, Company - Max Barry, How The Light Gets In - MJ Hyland, Jennifer Government - Max Barry, The Hunger Games Trilogy - Suzanne Collins, The Art of Looking Sideways - Alan Fletcher, Snow Falling on Cedars - David Guterson, The Virgin Suicides - Jeffrey Eugenides.